Something happens, we’ve noticed, when people like us and like you – neighbors, teachers, parents, local businesses, religious institutions, local nonprofits – decide to invest time, energy, and money in our own neighborhoods. When we team up to tackle a particular problem in the community, when we roll up our sleeves and just get started, what often happens is that local authorities suddenly want to help. They want to help, even though the project previously hadn’t been on their radar. They want to help, even though they may actually have said “no” to this project last year, believing it to be not a top priority, or not doable. It’s a little bit like magic, and we see it happen time and time again. 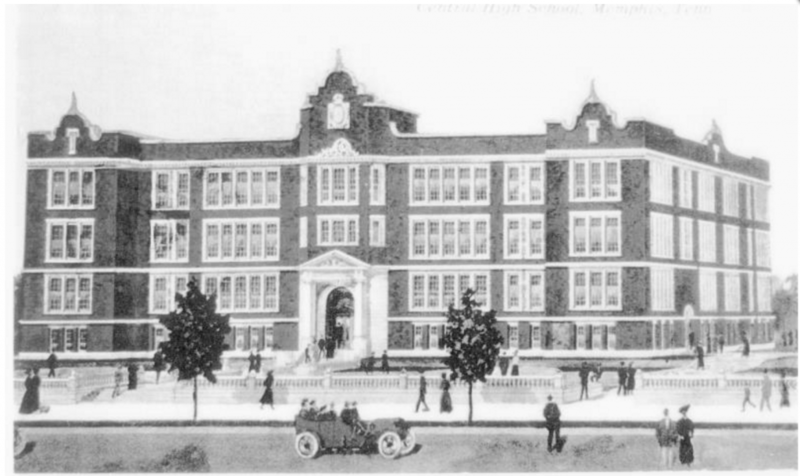 Central High School, a predominantly African American school in urban core Midtown Memphis, is a great example. Parent Katy Leopard and her collaborators wanted the front of the school to reflect its hard-won academic excellence, and they set to work. Here’s what happened. “Central High School is kind of a landmark in Memphis,” explains Leopard, “but as the public schools in our urban core have been abandoned, it has stayed a really excellent school. It continues to put out really great students that go to really great colleges and get scholarships and do really well – but by the skin of its teeth.” In other words, all of the school’s money goes straight into education, with little left over for “extras” like landscaping, fresh paint, new windows. The moment Leopard really knew she wanted to do something about the appearance of Central High was the moment her son, Brady, got the lead role in the school play. Thrilled and proud, she invited all kinds of family and friends to come see the play. Then she stopped to consider how the school would look to them when they actually walked up to it. It was a rude awakening. So she approached the school and got the green light to set up a modest $3,000 ioby campaign. The money would establish a couple small little gardens on the historic school’s grounds: a native pollinator garden that would attract butterflies and require little watering, a small arboretum with plaques listing the names of the different trees. It would be a start, at least. But when it took just 24 for that money to stream in, she and her team decided to keep going – reaching out to alums, parents, local business leaders. Before long, they’d raised over $10,000. There was real energy behind this thing. Feeling inspired? Want to take action in YOUR neighborhood? If you have awesome ideas about how to make your town greener, safer, and more fun, let us help! Tell us your awesome idea right here. Pssst…. In OTHER ioby news: Sick of storing dozens of dusty old tools in your garage or basement? Wish there were a place you could go to borrow ladders, power drills, a lawnmower? Want advice from your neighbors about your latest home improvement project? Tool Libraries are back in vogue – here’s how Saint Paul, MN, is going about starting their own.